I am going to share some of my Georgian Orthodox Easter traditions. It is very different than Easter in the US. We do not have bunnies or kids hunting for eggs in the bushes. Preparation normally starts on Friday night. We color the eggs and make Paska, which is an Eastern European Easter bread. Mom usually boils the eggs and dyes them red using red onion skins. Sometimes she places cilantro leafs, or other plants that have interesting designs, against the egg and then wraps the egg tightly in a fine net (usually pantyhose). The resulting egg is imprinted with the pattern of the leaves. Next, she makes Paska. The recipe is at the end of this post. It's a Georgian tradition that after the Easter mass we come home and start the game of breaking the eggs. Each person gets an egg and then we alternate hitting eggs the tip-to- tip and bottom-to-bottom. The first person with the unbroken egg is declared the winner! One year, my neighbor got a wooden egg that resembled a real egg and broke all of our eggs (obviously). We quickly realized his ploy! P.S. If you like decorate your Easter table then, two weeks prior, you can sprinkle wheat seeds on a cotton ball in a container. The cotton ball should be moist with water. 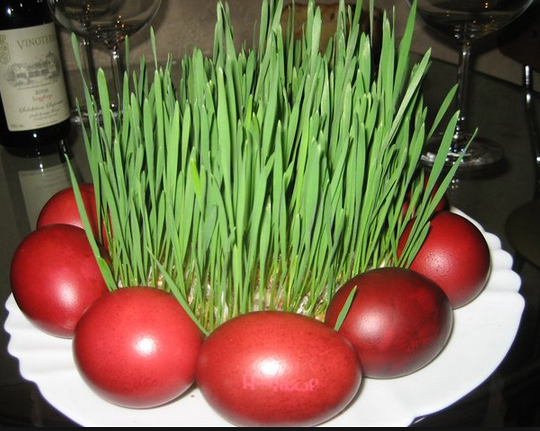 What grows in two weeks is called Jejili (grass), which is used as a table decoration. See the image below. Pre-Ferment: Add yeast to 1cup of warm milk. Next, add flour so that the consistency is like light sour cream. Add a pinch of salt and twice as much sugar. Wait for the mixture to rise. Keep it in a warm room. Dough:In a separate bowl, mix rest of the milk, sugar, eggs, and melted butter. Next, add the pre-ferment, 1cup of oil, and flour so that the mixture yields a coherent mass. Put the dough in a warm place and let it rise two times. After it rises for the last time, add raisins, cardamom and nutmeg to the dough. Several options are available for forming the loaves. If you have tin can forms, pour the dough into forms wrapped in parchment paper. You can also form the dough into a braided loaf or however else you please. Here, we assume you are using forms. Make sure that you fill the forms halfway. Put the filled forms in a warm place and let the dough rise again. After the dough rises in the forms, bake them in the oven at 355F for 35 minutes and then lower the temperature to 320F for 25 minutes. Happy Easter!